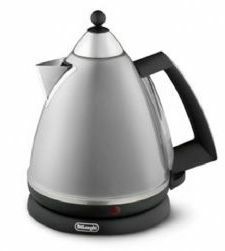 Delonghi KBX2016AZ Kettle Making mornings brighter, the DeLonghi 1.7L Brillante Kettle is a great option for heating up water for your tea or coffee. Designed with diamond shaped trims and a plastic faceted finishing, it exudes a sophisticated visual appeal when placed on your kitchen countertop. The DeLonghi 1.7L Brillante Kettle features a detachable, 360 degree swivel base, allowing you to pour water without the power cord getting in the way. Easy to maintain, the DeLonghi 1.7L Brillante Kettle comes with a washable and removable anti-scale filter.